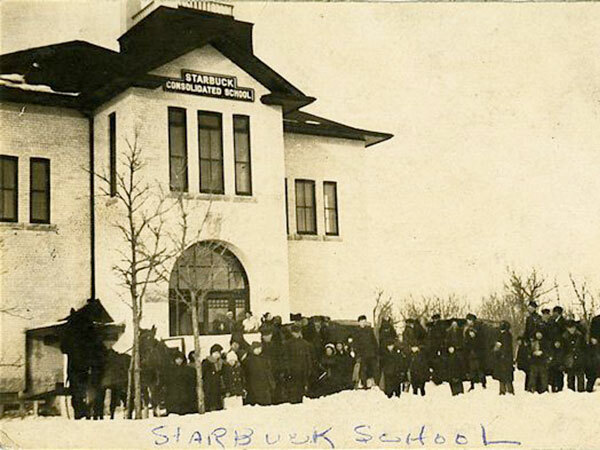 The Starbuck Consolidated School District was organized in August 1909 as a result of consolidation of Holyrood School No. 391, Kinlough School No. 784, and Starbuck School No. 1150. 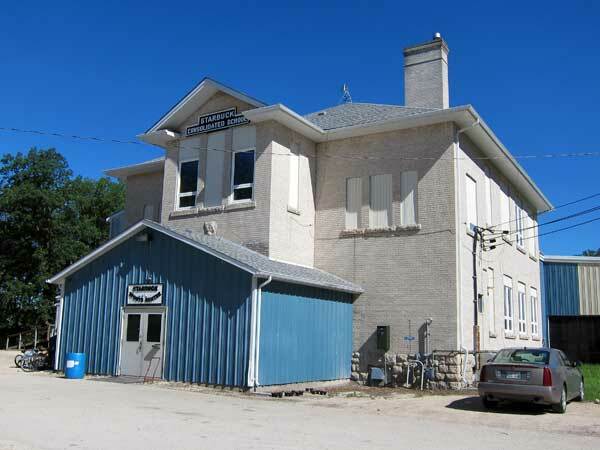 The 10-acre school site bordering the Lasalle River in the village of Starbuck, in the Rural Municipality of Macdonald, was purchased at a cost of $1,000. 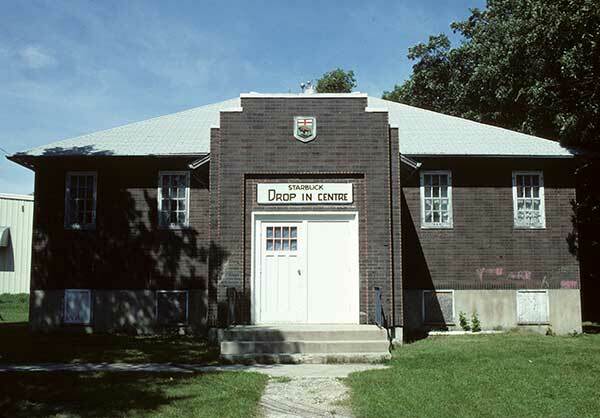 In 1910, a two-storey building, designed by Winnipeg architect E. D. Tuttle, was constructed of white bricks on a stone foundation. 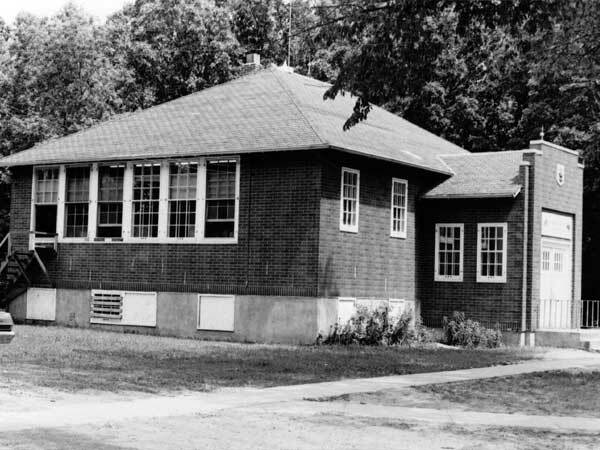 It featured four classrooms, two on each floor, as well as a laboratory, a room for “storage of chemical and physical apparatus,” and a library. Two playrooms were located in the basement, along with two lavatories, a forced-air furnace room, a coal storage room, and a storeroom. The total cost of construction was $17,000 acquired by the sale of old school property and the issue of debentures. It opened in mid-November 1910 under principal Andrew Moore. For we’ve faith in our consolidated school. Hark! Hark! Hark! The children marching! Hear the rumble of the vans! Praises for our good consolidated school. For we never fear the snowdrift any more. 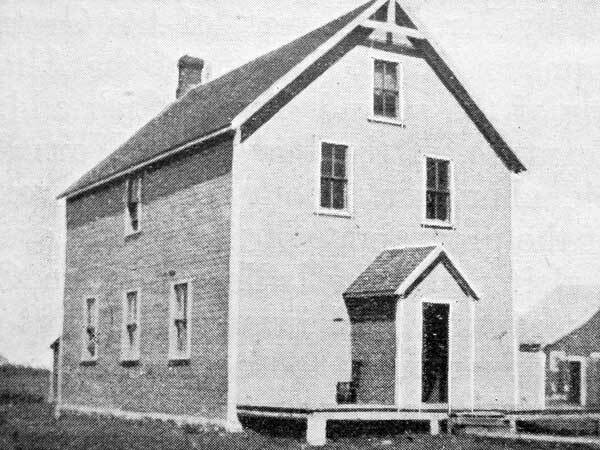 The Starbuck School Board later constructed a separate, one-storey building nearby, now demolished, that was used as a high school. Source: Education Department Report, 1910, Manitoba Legislative Library. 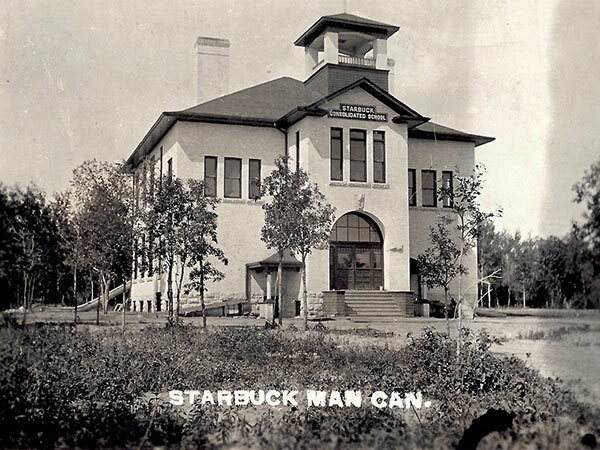 Source: Archives of Manitoba, Architectural Survey - Starbuck 8. Source: Historic Resources Branch, Public School Buildings Inventory, slide 640. Tenders, Manitoba Free Press, 25 February 1910, page 2. 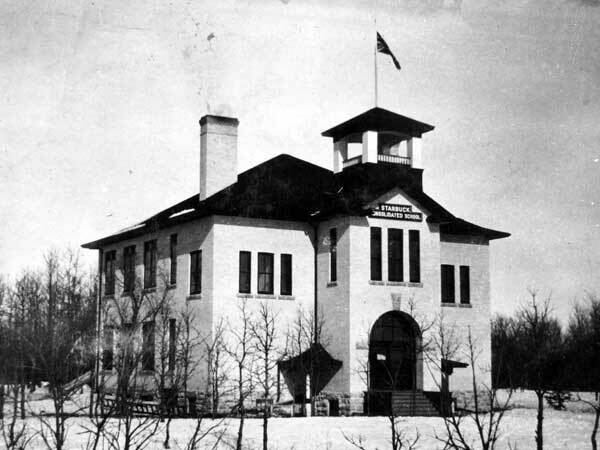 Consolidation of Rural Schools in Manitoba: Special Report of the Department of Education for the Year 1912, Manitoba Legislative Library, Manitoba SpR 1912 Rural Schools. “Celebrating the contributions of rural permit teachers,” The Valley Leader, 3 June 2009. 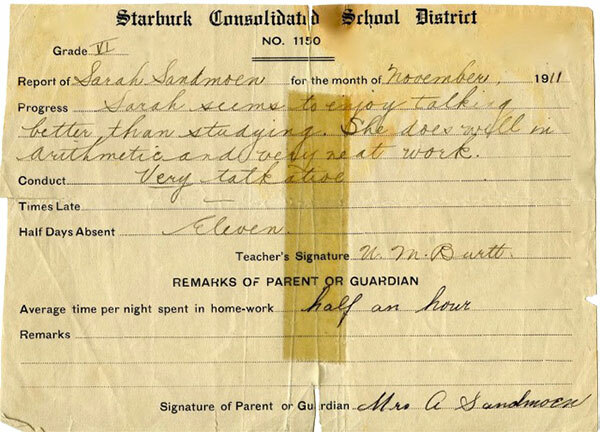 Manitoba School Records Collection (GR0638), Starbuck School District No. 1150 Daily Registers, Archives of Manitoba. School division half-yearly attendance reports (Schedule: E 0757), GR 1628, Archives of Manitoba. We thank Randy Rostecki, Phill Hoxie, Cindy Nachtigall, and Rowena Jones for providing additional information used here.